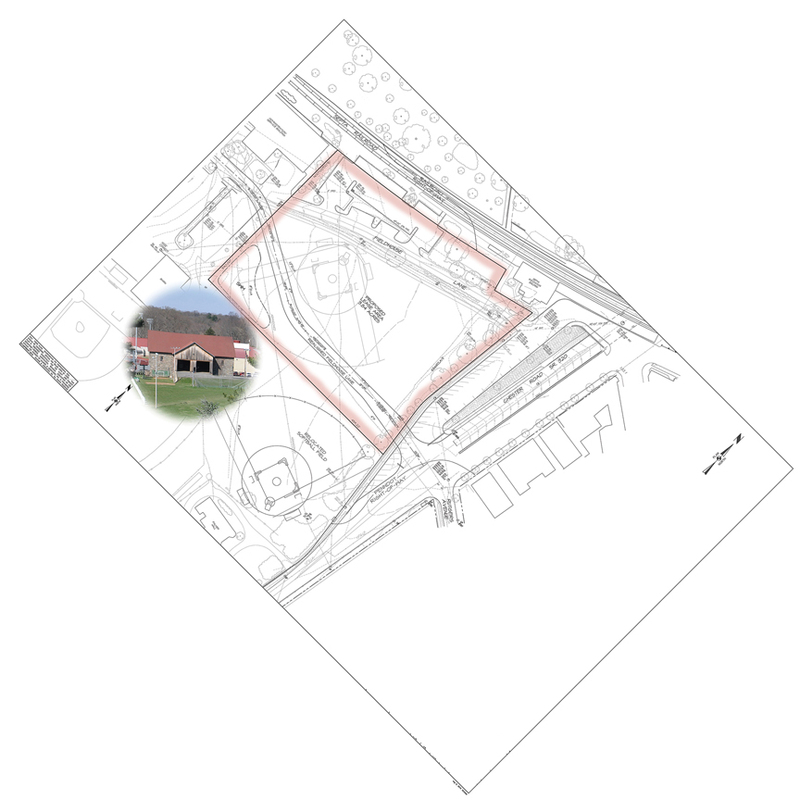 The College’s current softball field on the Town Center West site will be moved closer to the Palmer Residence Hall and will remain a natural turf field with dugouts, backstop, and fencing similar to the one that exists today. Swarthmore’s 130-year-old barn will be preserved. Picture a group of visiting scholars on campus attending a conference on the future of the liberal arts. Or alumni gathering in a comfortable inn and restaurant space on campus, meeting with faculty and students to discuss the College’s vision and commitment to sustainability issues. Imagine faculty, students, and staff mingling with Borough residents at an inn, restaurant, and bookstore at the edge of campus. These opportunities will soon exist for the Swarthmore community as a result of the Board of Managers recent approval of a plan that includes building a 40- to 45-room inn with conference space and a restaurant and relocating and expanding the campus bookstore. Following more than a decade of study, the project, named Town Center West (TCW), is expected to be completed by late spring 2014 on a College-owned site adjacent to the athletic facilities and close to the regional rail line. President Rebecca Chopp noted that TCW would support a number of College objectives including the need to create the kind of spaces necessary for the “robust and evolving intellectual life of faculty and students.” According to Provost Constance Hungerford, faculty are eager to have nonacademic spaces where they can meet with colleagues more informally, and across departments, in an increasingly collaborative and interdisciplinary intellectual landscape. The inn, restaurant, and conference spaces will also allow departments and the College to host small conferences on campus during the academic year for the first time in its history. 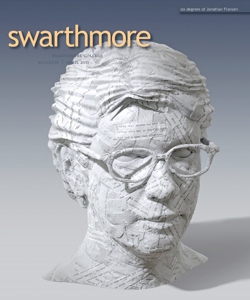 During a time when many in the United States advocate for a more vocational approach to higher education, other countries are interested in replicating the liberal arts model in which Swarthmore excels. “Many alumni, faculty members, staff, and students voice a long-held desire that we play a more active and more visible role regionally, nationally, and internationally in order to contribute in a more meaningful way to the conversations about the future of the liberal arts,” Chopp said. TCW also meets another longstanding objective—to help revitalize the Borough’s commercial district and strengthen ties between the College and Borough. 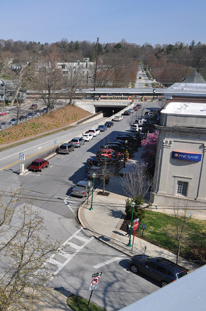 The idea for TCW first arose in a 1999 planning document titled “Swarthmore Town Center Revitalization Strategy,” prepared by Urban Partners with Kise Straw and Kolodner. This 34-point plan was the result of study and analysis of current and projected economic conditions in the Borough and included input from more than 900 individuals, including members of the College community and Borough residents. It has since served as a blueprint for the Borough’s revitalization efforts and many of its suggestions have been implemented. 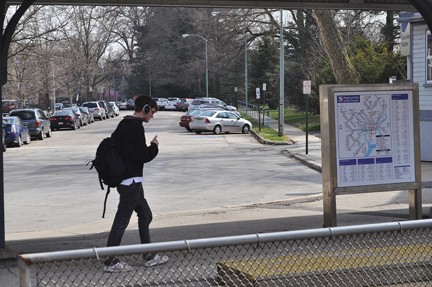 The Swarthmore train station is a just a short walk from where the Town Center West project will be built. An inn would also help meet the practical need to provide close, comfortable lodging and dining options for alumni, prospective families, visiting athletes, and friends and family members of Borough residents. As is typical with development projects, TCW has gone through an extensive vetting process since it was first proposed in 1999. After requesting qualifications and proposals from potential developers in 2007, the College put the project on hold during the financial crisis of 2008 and 2009. In 2010, prospects for TCW were bolstered when the Borough received a $2 million grant from Pennsylvania’s Redevelopment Assistance Capital Program. (See July 2010 Bulletin.) After further study over the course of this year, the College decided to self-develop TCW, concluding that self-development would allow far greater control with respect to meeting the project’s primary mission to support College objectives as well as more control over the management of its lodging, restaurant, and meeting spaces. In addition to the state funding, there has been donor interest in the project because of its potential to further the College’s educational mission, according to Suzanne Welsh, vice president for finance and treasurer. She added that the College will have additional opportunities to pursue grant funding and will not tap into operational funds to finance the project. The new inn, just off Chester Road (above), will honor the principles of the American College and University Presidents’ Climate Commitment, of which President Rebecca Chopp is a signatory. This commitment includes designing the project to the U.S. Green Building Council's LEED Silver certification. A steering committee, comprised of senior members of the administration and Board members, is managing the project through the formative stages. Last fall, the Board of Managers appointed a TCW Ad Hoc Advisory Committee, which included faculty, students, and staff. The Committee met throughout the year to act as a sounding board for the steering committee and provide feedback from the College community. The College also commissioned two independent market studies to guide decisions about the appropriate size and amenities for the inn, restaurant, and meeting space. Both studies recommended an independently operated three-star inn with 40 to 45 rooms, a small business center, and a combined restaurant/lounge with about 100 seats—plus seating for outdoor dining in good weather and an outdoor function space. Community members and Borough residents alike have expressed interest in the future shape the project will take. Borough residents have shared concerns about traffic patterns and environmental considerations, among others. The student group, Swarthmore Labor Action Project (SLAP) has raised the possibility of unionizing the hotel staff in order to ensure positive working conditions. To address some of the issues that have been raised, the College hosted two forums this spring, one on the hotel industry, featuring a presentation by a hospitality industry expert, and another featuring a panel discussion on labor issues. Other public forums will be held in the fall. The College has also developed a website, which is frequently updated with new information about the project and provides answers to new questions as they arise. In March, President Chopp reaffirmed the College’s commitment to a positive work environment for anyone working on Swarthmore’s campus and issued a statement of principles in a guest column that appeared in the student and local press. The College’s principles include an unwavering commitment to ensure that every employee will work in a safe and healthy environment; that each person will be able to discuss issues freely; and that every worker will be empowered to make their own choices about whether or not to join a union. Read the full text of the guest column. The College and Borough continue to collaborate closely on TCW. The College will begin the architectural design process shortly, and the Borough will undertake a series of zoning and land use reviews before the project is considered fully approved.